Fractures of the foot happen quite frequently, primarily due to stresses and strains applied to the foot as well as the simple fact that the foot seems to be a focal point for trauma. The purpose of this page is actually to discuss various types of fractures that occur primarily in the foot. Since fractures can occur any where in the human body there are plenty of reference sites on the internet that discuss the mechanism and treatment of fractures in general. The first foot fracture I would like to mention are stress fractures. They are not limited to the foot, but are very common in the foot. Stress fractures of the foot were first identified in 1855 and were known as "march fractures" because they were associated with the pain and swelling that some soldiers experienced while marching. Too much repeated pressure on a bone forcing it to break. This is known as an overuse injury. That is why it is more common in athletes. Metatarsal Stress Fractures The most common site for stress fractures of the foot is the metatarsal bones, but the most common site in the body for a stress fracture is the tibia. Notice the x-ray below. The fracture line is easily identified. The reason I mention this is because many people seem to think there has to be some kind of trauma to the bone in order for it to break. This is not always the case. When a patient presents to the office with the cardinal signs of tenderness, redness, and swelling over a localized area of the forefoot, usually on top of the foot, with no history of trauma, one of my first thoughts is stress fracture. A typical scenario may have been spending a day walking in the city wearing dress shoes, carrying packages that may have added additional weight to your feet or forced you to walk in a more abnormal manner. However, rarely during the day will you remember any kind of trauma to the foot. You get home, one foot may be a little more sore than the other, but when you wake up the next morning the affected foot is very sore, generally red, and usually swollen in the area. In simple stress fractures where the two broken ends line up next to each other and there is virtually little space between the two ends, a surgical shoe, which is a stiff flat-bottomed shoe will suffice, until the bone heals. The good news is that the lion’s share of stress fractures are of this nature. 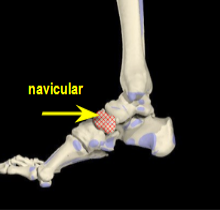 Midtarsal Stress Fractures It is important to note that stress fractures of the tarsal bones such as the navicular or cuboid bone can be much more difficult to diagnose. These two bones may be broken and never reveal any radiographic evidence. Usually an MRI will be performed and the diagnosis will come back as increased bone marrow edema, which is swelling of the middle of the bone commonly seen in over-stress of a bone. It is important to note here that increased bone marrow edema may also occur in non-fractured bones. The thing to do here is to err on the side of caution and correlate the MRI findings with the patient's clinical symptoms and treat the problem as a fracture. Another option for suspected fractures in this area of the foot is to have a CT scan. Computerized tomography has the ability to better visualize the cortex (outer surface) of bone and may be able to pick up fractures where the MRI failed. 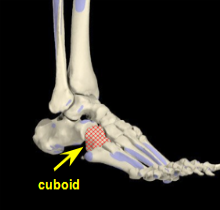 Treatment of cuboid or navicular stress fractures is non-weightbearing casting usually for six weeks, followed by two weeks or so of limited weightbearing and physical therapy. Because of the stresses placed on these bones in the gait cycle, walking casts as an initial form of treatment has been found to be unsatisfactory. In cases where non-weightbearing casting fails to heal the stress fracture, surgical intervention may be indicated. The other very common type of fracture seen in the foot is a fracture of one or more of the toes. There is almost always a history of trauma, usually stubbing your toe against the bedpost when going to the bathroom during the middle of the night (hence the name bed-post fracture). In this case the toe will usually be painful, red, bruised and swollen. The reason I even bother to mention toe fractures is that there is a general misconception that there is no treatment for toe fractures. That could not be further from the truth. The toe is very similar to the finger and there certainly is treatment for finger fractures. The severity of the fractured toe determines the treatment. For the vast majority of fractured toes the treatment is simple. The fractured toe has to be taped to the adjacent toe. This is known as "buddy splinting". By doing this you are able to somewhat immobilize the fractured toe so it can heal. If a fracture site is not adequately stabilized the fracture may not heal (some simple fractures will heal on their own). Purchase one inch wide hypoallergenic cloth tape. Since the toe(s) are going to be wrapped for a number of weeks in a closed shoe, the tape should be hypoallergenic to avoid irritation. Purchase non-sterile two inch by two inch gauze. You will be placing this in between the broken toe and the adjacent toe to cut down on perspiration which can lead to athletes foot and tape irritation. Wash and dry the affected toes well with soap and water. Place a folded 2x2 gauze pad in between the two toes. Tear off strips of tape in 3 to 4 inch strips. Tear these strips in half, longitudinally, to create half inch wide strips. Starting at the base of the two affected toes (the fractured toe and the adjacent toe), wrap a strip of tape around both toes, firmly but not too tight. Place the next strip next to the previous strip with some overlapping of tape and wrap this strip around both toes, firmly, but not too tight. Continue wrapping the tape until you have reached the nail. Wear a shoe that will accommodate this taping and not put too much pressure on the broken toe. Change this taping daily, leaving it on longer opens the toes to infection. Do this until your doctor has performed a follow up x-ray and determines that the fracture is healed. When a fracture does not adequately heal you are left with scar tissue in the fracture site and what is known as a pseudoarthrosis or more commonly known as a non-union. The significance of this is the fact that the toe may always continue to hurt, thus requiring surgical intervention, or at the very least you will always be the one who can predict when it is about to rain, because the toe will start bothering you, (changes in barometric pressure will irritate the fracture site). I find that once I demonstrate to the patient how to properly tape the toe they are usually able to get their foot into a wide boxy shoe. Dress shoes are out until the bone is healed, even if the toe does not hurt, the dressier the shoe the more it may force a poor alignment of the broken toe. The other misconception that patients have is my ability to look at a foot or toe and tell if it is broken. The only way to know is through an x-ray (sometimes small fractures will not show up and a bone scan or MRI need to be performed to find the break.) When I “guess”, to appease the patient, I am wrong in about fifty percent of the cases. The sesamoid bones are two bones located just below the big toe joint. Their purpose is to act as a lever or fulcrum for the tendons that allow the big toe to bend downward. Fractures of these two bones generally occur when there is a hyperextension (excessive bending up of big toe) injuries. Many times the force of the injury will break the sesamoid bone into multiple fragments. Less frequent to the sesamoids are crush injuries. When there is a history of trauma certainly a fracture has to be considered but the harder diagnosis is when there is no history of trauma and there is pain in the sesamoid bones. Many times a fracture in such a small bone(s) will not show up on x-ray and a bone scan or MRI will be needed to actually find the fracture. The diagnosis can be further complicated because some people exhibit what is known as a bipartate sesamoid, meaning instead of having one sesamoid bone there is two separate bones that make up the one sesamoid bone. A fractured sesamoid can be a very difficult problem to remedy due to its location. 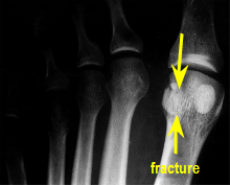 A fractured sesamoid is usually casted in such a manner as to keep pressure off the bottom of the foot. Once healed it can still be a few more months before a person can return to their normal activities. In cases where the fracture does not heal and there is constant pain, the sesamoid bone may have to removed. This, however, can have implications in the way the big toe joint functions. In the foot there are two areas that are prone to taking “forever” to heal even in simple fractures. These are the neck of the talus and the base of the fifth metatarsal bone. The diagram below shows the two places where fractures can take longer to heal. The top arrow is the neck of the talus, usually the result of a sudden upward jarring of the foot as seen in car accidents, and the bottom arrow points to the fifth metatarsal base foot fracture, more commonly known as a Jones fracture which can be the result of 1. trauma, 2. a forceful twisting motion or 3. the breaking of bone as a result of the tendon that attaches to the base pulling (avulsing) part of the bone off. As a general rule, if you sprain your ankle and have x-rays of the ankle taken, you should also have x-rays of the fifth metatarsal base taken as well. The reason for this is that both areas are poorly vascularized meaning the blood supply to these areas is less than the other surrounding bones. Since blood is the vehicle that carries healing nutrients to an area, any site that has diminished blood flow will have longer healing tendencies. I mention this so that if you happen to be suffering from a fracture in one of these sites you should not be alarmed if it takes longer than usual. Many times in addition to the standard treatment of immobilization for a broken bone, these two sites may require a bone stimulator to heal the foot fracture or even surgery to fix the break. You should by all means discuss this with your doctor. As an added note, recently some doctors have begun using ESWT or Extracorporeal Shock Wave Therapy in fractures resistant to healing. ESWT has been used primarily in orthopedic medicine to treat painful ligaments and tendons but in small studies has also been shown to stimulate bone growth in a fracture site, thus increasing the healing process.